Voter turnout in Bahati constituency and Chilyapa ward of Mansa Central constituency has been low due to the rains which started in the early hours of today. Zambia News & Information Service reports that Luapula Province Electoral officer Amusa Zaza, said the numbers of voters are expected to increase as the day progresses. Zaza said after evaluating the circumstances, time would be compensated to the polling stations that might not have opened on time. People of Bahati with a total of 43,827 registered voters go to the polls to decide who will represent them in parliament in the remaining two years. Five participating candidates, Charles Chalwe from Patriotic Front, Isaac Lukwesa of People’s Alliance for Change, Justine Bwalya of the United Party for National Development, Clement Mwila – United Prosperous and Peaceful Zambia and Emmanuel Chanshi of Forum for Democracy and Development. 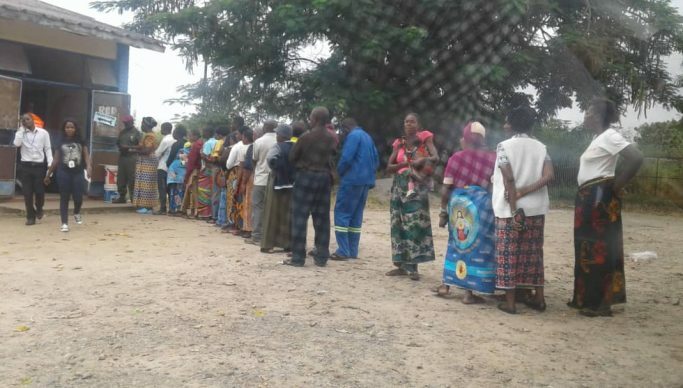 Meanwhile, in Roan constituency voting started on a low note with only 270 having cast their votes out of 1,013 registered voters at Nkulumashiba Primary school Polling Station by 11:00hrs. At Dambe Twashuka Secondary School Polling station only 155 had voted by 10:00 hrs out of 800 registered voters while at Roan Antelope Secondary school 102 had voted out of 797 registered. Roan Primary School, Kafubu Primary school, Fisansa, Nkulumashiba High School and Sports Complex. The Electoral Commission of Zambia is also conducting seven Local government by-elections in Chinyanja Ward in Kabwe, Makunku Ward in Itezhi-tezhi, Chilyapa Ward in Mansa, Lengelengenda Ward in Chavuma, Mfinshe Ward in Mungwi, Muyondoti Ward in Mitete and Muchinga Ward in Chama. The By-elections in Bahati and Roan constituencies have been necessitated following the expulsion of incumbent, Harry Kalaba on January 28, 2019 and the crossing of the floor of Chishimba Kambwili from Patriotic Front (PF) to NDC as declared by the Speaker of the National Assembly on February 27 2019. The vacancies in Chinyanja, Makunku, Chilyapa, Lengelengenda, Mfinshe, Muyondoti and Muchinga wards are as a result of resignations and death of councillors. The polls are taking place from 06:00 hours to 18:00 hours.